Ruthiebear (Titusville, NJ, United States) on 10 July 2017 in Transportation. Joli défilé de ces voitures de pompiers, j'aime les couleurs qui tranchent avec celles des arbres. A dynamic sight and a great moment in the Day. A long long line of servers. My appreciation to or all his work. Photographed from an impressive position, nice result. Lots and lots of bright red and other colours. Nice treatment of the photo. Superb composition in beautiful colors. Stunning image. Bonjour douce Ruth, quelle belle parade, superbe! Bise, bon lundi dans la joie! Love the treatment. Great shot! A fascinating street shot of these fire trucks. An excellent viewpoint here. It has served to make them look even bigger and more "awesome". The perspective on the red trucks is impressive and beautiful! Very beautiful , composition and colors are superb ! A beautiful line of red trucks. I like that lone red balloon, too. A great PoV captured here showcasing this queue of fire trucks!! Beautiful processing as well. Wonderful point of view! That is a lot of fire trucks! I love the color! I am glad it is a parade and not a disaster. Impressive display by the fire department. 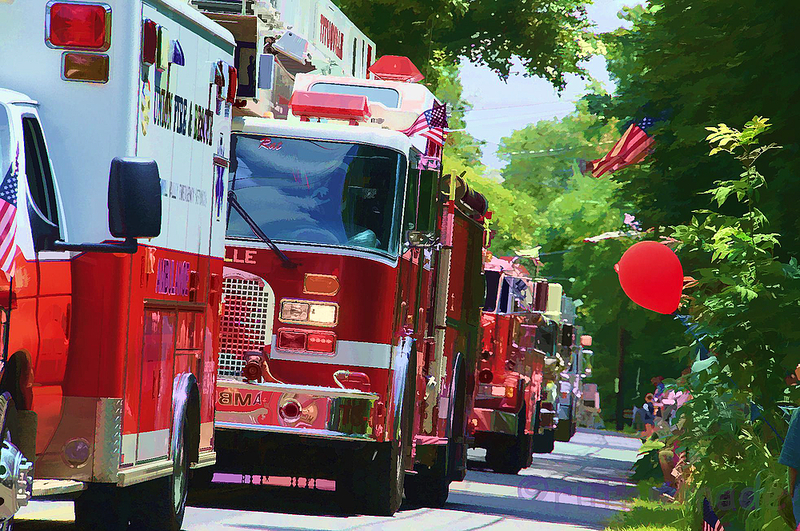 A beautiful and colourful line up of fire trucks with the flags and balloons.